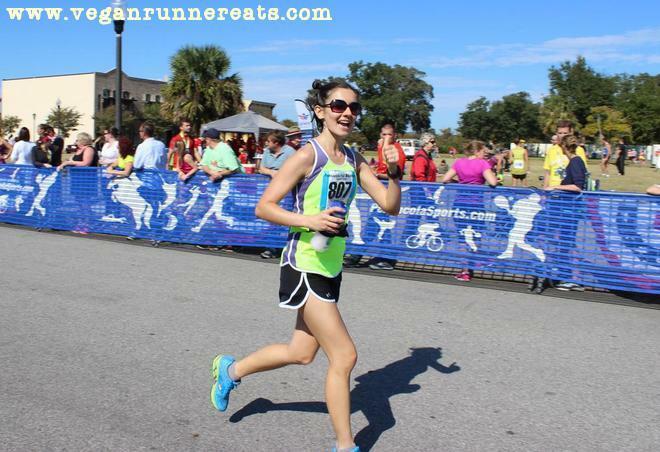 Wow – I can’t believe that I’m sharing my Pensacola Marathon recap today! This past Sunday, 11/10/2013, I’ve completed my Vegan Marathon Challenge – something that I’ve been working on for sixteen weeks. I trained for my first marathon (my second overall) since going vegan to show that regular people like myself can accomplish serious athletic goals like running a marathon just fine on a vegan diet. Another little milestone: I started this blog on the first day of my marathon training, and I can really see how it got better week after week, and now it even kind of looks like I know what I’m doing 😉 . 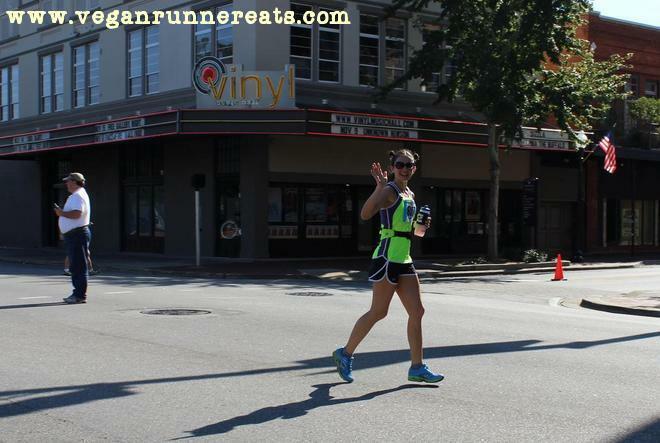 The Vegan Marathon Challenge is over, but I’ve got some great ideas to keep this blog going! At the start line of 2013 Pensacola Marathon, 6:25 am. So how did it go? Here are my official stats: my time for the full marathon was 4:08:18, average pace 9:29 min/mile, I was 8th in my age group out of 40 women. 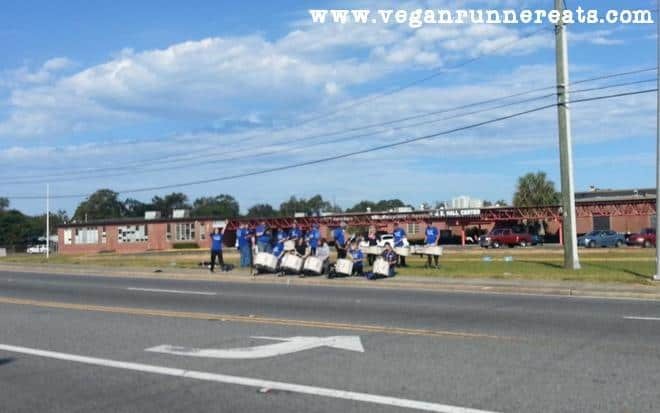 This marathon in Pensacola, FL, is pretty small by average national standards, but it’s very well organized and monitored, and Pensacola is only about 50 min away from the city I currently live in. No across-the-country flying? No huge crowds? No stress or hassle? I’ll take that any day! 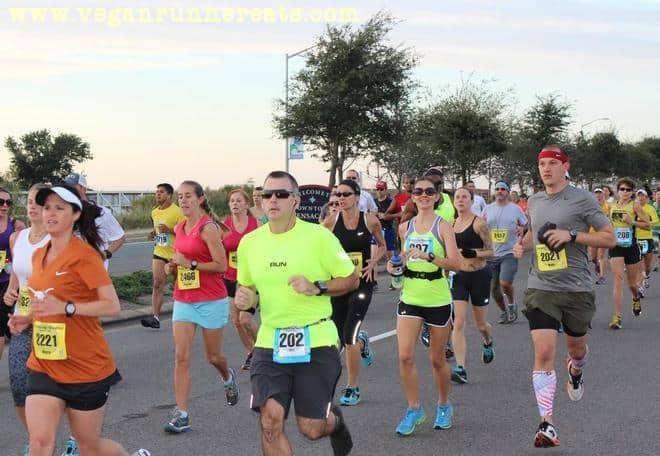 You can see my week-by-week reports on how my training was going on My Vegan Marathon Challenge page. So what were my race strategies to make sure my first vegan marathon was successful? Naturally, there was a lot of planning involved that was often much better in theory than in practice. To show you what worked and what didn’t, here’s a list of my strategies with both theory and practice. If you’ve never done a marathon but are thinking of doing one someday, this might help you a bit. 1. TRAINING. Theory: to train well for 16 weeks, complete a long run every weekend starting from 7 miles the first Sunday and going up to 20 miles three weeks before the race day. Practice: the first 8 weeks went very well, culminating with a good 18-mile run on the 8th Sunday. After that, things weren’t so great: my husband Rob and I went out of town for a month (a week of vacation followed by 3 weeks in Seattle, WA area for Rob’s work). I was mostly able to stick to my training plan while traveling until I pulled a muscle in my foot on a casual run in Washington, which forced me to stop running for a week and then miss the most important 20-mile long run three weeks before the marathon. Just when my running got back to normal, I got sick with a bad cold 2 weeks before the race and missed even more training. Did It Work? The theory was perfect, but the reality is usually much less than perfect, and that’s okay because we are but humble humans. If training didn’t go as planned, our best bet is to reevaluate our race goals. 2. NUTRITION LEADING TO THE RACE. Theory: to consume lots of carbohydrate-rich foods in order to have plenty of glycogen stored in my body. Glycogen is used for energy during endurance exercise, so it’s important to have plenty of it at the start of a race. It is believed that our bodies can store enough carbs to last us for about three hours of steady running in a marathon (this may vary from person to person), but to avoid getting burned out, we’re supposed to consume simple carbohydrates throughout the race. Practice: I ate my weight in carbs (well, almost) every day leading up to the race! I usually don’t skimp on carbs and starchy foods as a vegan, so in the week before the race I had lots of carbohydrate-rich whole foods like rice, potatoes, quinoa, vegetables and fruits, and homemade whole-grain baked goods. Trying to curb my fiber intake the night before the race, I made a simple pasta with marinara sauce and some sautéed vegetables that we ate with a white baguette. The morning of the race: white English muffin with raspberry preserves, a banana, and a cup of tea about an hour before the start. Did It Work? It did very well! My stomach was very calm and settled on Saturday night, and on Sunday morning it didn’t give me any trouble, except from some pre-race jitters. 3. NUTRITION DURING RACE. Theory: have plenty of sports gels, bring my own handheld bottle, drink an electrolyte beverage instead of water the whole time. The main goal was to stay well-hydrated and have enough easily digestible carbohydrates in my system. Practice: I packed 4 of my own gels and started consuming them after 1 hour of running, then at 2 hours, at 2:45, and the last one at 3:20. I had a 16-ounce water bottle that I filled with water with an electrolyte tablet at home, and then refilled it with the sports drink the race provided 3 times. Did It Work? It did! My stomach didn’t bother me at all. I found it important to practice hydration and nutrition strategy on my training runs to get used to the taste of this stuff. Having a bottle with you at all times saves you a lot of stress at water stations since you don’t have to stop at those, plus you can drink whenever you’re thirsty. Trying certain gels before the race will show you if your stomach can tolerate them well, or if you should try other brands. Some endurance runners prefer to forego gels for nutrition, and use more natural food like dried dates, salted potatoes, bananas, and maple syrup-based sports drink that they make at home. Of course, this means carrying all of this with you during the race, or having a friend supply you with those at designated stops. I’d like to try this strategy one day – if not potatoes, then at least dates and bananas. 4. RACE PLAN. Theory: To run my own race and not get carried away by sudden ‘genius’ ideas. My plan was to start out slow and run the first few miles at 9:30-9:45 speed to save energy, then gradually speed up in the second half to 9:00-9:10. I was going to consider a negative split (the second half run faster than the first – an optimal strategy for any race distance) a success, and if I managed to avoid walking at all, then it would have been even better. To make it under 4 hours, or at least beat my last year’s time (4:04:45) was the pinnacle of my expectations! The pacer of the 4-hour group was pushing a little too hard for such early stage of the race. As the next 9 miles went by, I couldn’t shake off the feeling of upcoming trouble when I checked my watch and saw that the pace we were maintaining was a bit too fast for me. Every mile was run in just under or over 9 minutes, and while I could keep up with the group, it turned out to be too much. With all of the training I missed in the last few weeks, I had no business running the 15th mile in 8:59 without a bad crash later! After mile 15, I dropped back from the 4-hour group while I was still feeling good, and slowed down to 9:15-9:35 for the next seven miles. The course had a couple good hills, and I was glad that I had enough strength to run them without stopping. At mile 23, however, I hit the every-runner-dreaded wall and slowed to a walk. Miles 23, 24, and 25 were covered in 10:47-11:09 min/mile with me walking two more times. As soon as I passed mile 25 marker, I gathered every last bit of strength I had left, and powered through my last mile in 9:39. The remaining 0.2 miles turned out to be 0.45 miles according to my GPS, and those were covered in 3:55. Total official time – 4:08:18, average pace 9:29 min/mile. Did My Race Plan Work? Chances are, it would have worked fine had I trusted myself more. Also, if I had done a couple more long runs in the weeks before the race and hadn’t gotten sick, I would have probably done better. Despite the mishaps, I’m proud of my time because finishing a marathon is always an accomplishment regardless of how long it takes. Oh, and the 4-hour pace group wasn’t a complete success: while some of the people in the group managed to finish in under 4 hours, the pacer also hit the wall at mile 22 and finished at 4:05. Marathon has a great humbling power on anyone regardless how confident they are. Looking fresh for the camera just before crossing the finish line! 1. A balanced vegan diet works for people with a lofty athletic goal like running a marathon! In fact, consuming lots of whole foods such as vegetables, fruits, and mostly unrefined carbohydrates helps us recover faster from hard training and racing. 48 hours after my marathon, I feel fresh with just some minor muscle soreness. 2. Always run your own race! If you did your research on optimal marathoning, followed your training plan almost perfectly, and felt good throughout your preparation, then you should always trust yourself and your race strategy more than what other people may suggest mid-race. I don’t blame the 4-hour group for not hitting my goal because it was my own decision to go fast with them too early – I should have trusted my own plan more. 3. During training, long runs are of crucial importance, and ideally you shouldn’t skip them, especially in the last 3-4 weeks. If for any reason you did, you’ll need to adjust your expectations for the race. 4. Run some hills during training! Even if you hate hills, running a hilly route at least once a week will give you a healthy advantage in any race. It is advised that we should run hills by effort, not by speed, meaning that as we go uphill, we need to maintain the same intensity as we had just before approaching the hill, even if it means that we might slow down. Hills in training are even more important if your race has a hilly course. 5. If you were sick or injured during training and still decided to do the race, have an exit strategy in mind, and make peace with it. If your injury flares up, your best bet might be to drop out to avoid getting even more hurt, and in this case you’ll need to inform your spouse/friends/anyone who knows that you’re in this race to meet you wherever you are. All races are supposed to have medical supervision, so if something goes terribly wrong, you should be covered. Don’t think dropping out is the end of the world: most likely, there will be another opportunity for you to do a similar race later. 6. Being a perfectionist is overrated. It is very likely that you’ll have some bumps in the 16 or more weeks of your training – life happens! Let it go, there’s no need to stress over every little thing. 7. 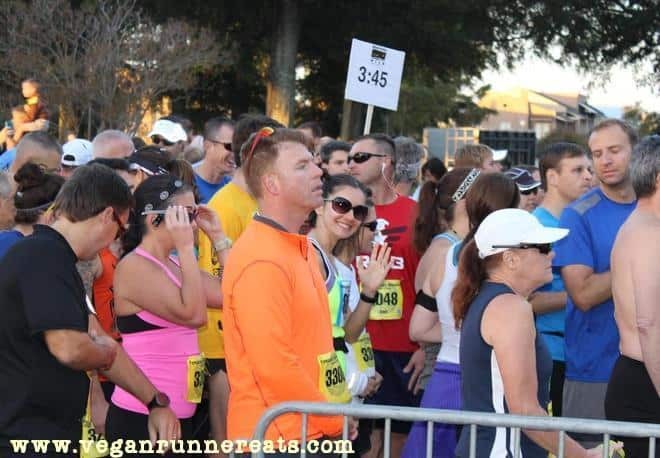 For safety reasons, write down a phone number of your emergency contact person on the back of your race bib. That’s not paranoid, just think of 2013 Boston Marathon! Whatever happens, we’re better safe than sorry! 8. Enjoy the race, and don’t fuss over your GPS readings! You trained for so long, now it’s time to have fun! So this is what I’ve learned from doing my #VeganMarathonChallenge. What’s next? More races, more vegan food on my blog, more experiments and challenges – but not before I take at least a week off from running! P.S. I’d like to thank my husband Rob for his amazing support of my marathon dreams! He’s been with me through all of my ups and downs, progress and self-doubt in training, and he inspired me not to give up on running Pensacola Marathon when I hurt my foot and then had a week-and-a-half-long cold just before the marathon. Rob, thank you so much, you mean the world to me! 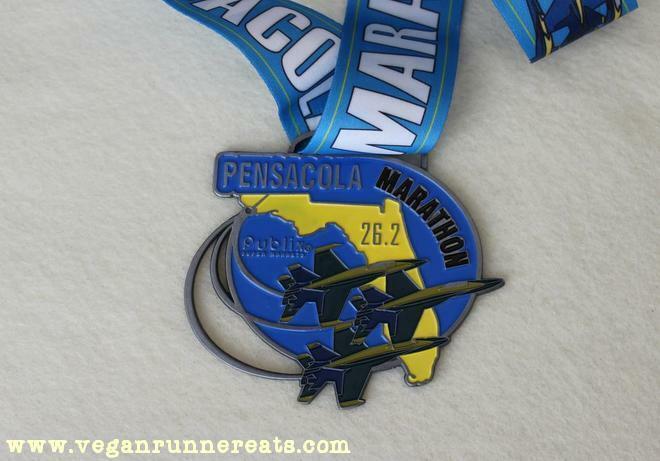 Tagged inspiration, marathon training, motivation, Pensacola Marathon 2013, running. Bookmark the permalink. Congratulations! Awesome job! My PRs have all come as a vegetarian – and I expect my vegan ones will be even better! Thank you Laura, and good luck to you in racing as a vegan!